So it seems the microwave has come a long way since I last invested in one way back in 2007 - sounds ancient doesn't it?! Whirlpool has completely revolutionised the humble microwave with their new Crisp N Grill model (GT286) that I was recently sent out to try. 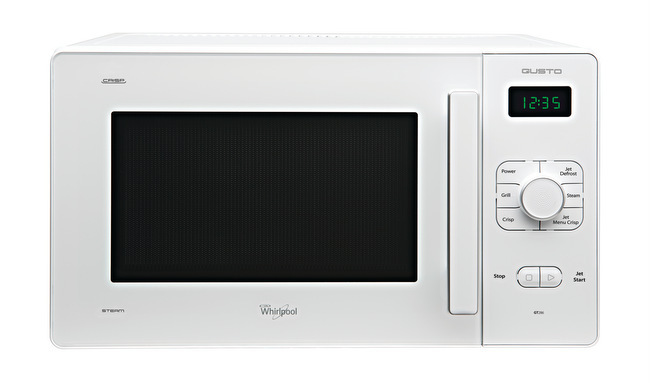 No longer just to re-heat (poorly at that), Whirlpool have come up with a microwave that is the ultimate kitchen appliance. This thing can reheat, defrost, bake, grill and steam too - yup you read that correctly. Gone are the days of soggy, unevenly cooked food - crisp, baked items in a microwave are now a reality! Evenness of cooking: Porridge is a daily staple at our place. 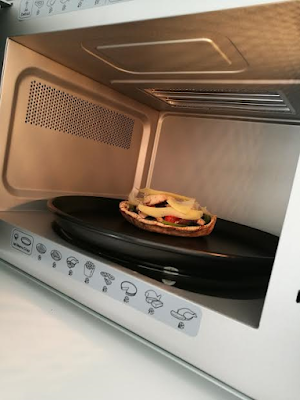 In a standard microwave this is prone to hot spots, uneven cooking and making you stir it item 1,000 times in 2 minutes of cook time. The Crisp N Grill has a 3D Microwave Distribution System which ensures food always cooks both evenly and thoroughly. 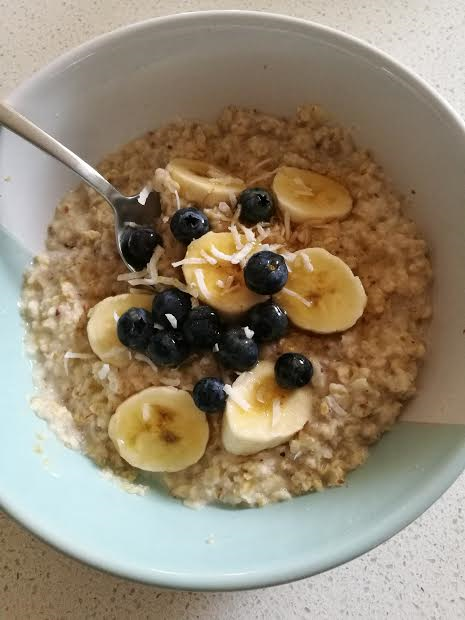 I am also a sucker for a frozen meal for myself (well it is better than not eating... or chocolate!) when I am in a mad rush to eat. We all know how hard these can be to cook (hot on top and frozen on the bottom) and the Crisp N Grill does these to perfection. 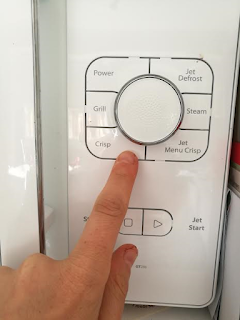 Crisp pastry: The thought of cooking pizza, sausage rolls and pies in a microwave is practically criminal isn't it?! I mean who likes soggy pastry? The Crisp N Grill comes with a separate crisping plate that is specially designed to reach the high temperatures needed to cook these items to crispy perfection (in mere minutes). I guarantee you will be amazed when you see how crispy your chips and baked goods are - oven baked quality in a fraction of the time. This is perfect when it comes to feeding the munchkins who don't really have much patience when it comes to waiting out 25 minutes for oven baked chicken nuggets! Healthy meals - FAST! 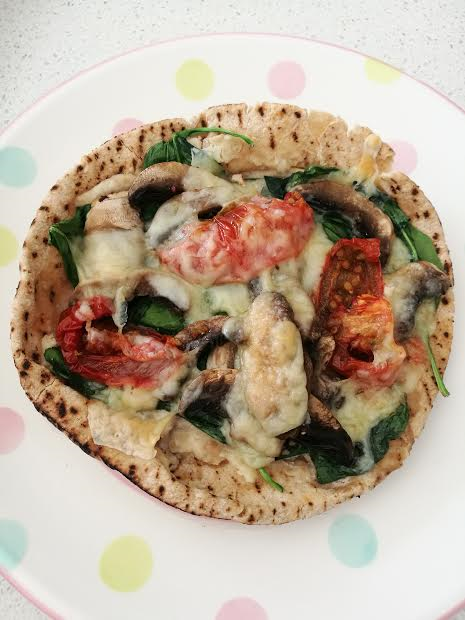 We love pitta bread pizzas here and I absolutely love the convenience of preparing these the night before, and microwaving these in a few minutes ready for lunch. The above is my creamy bean/ricotta topped pizza (must share this recipe soon) and as you can see it is browned on top and crispy on the edges and bottom, just like pizza is meant to be! Hard to believe that a microwave can now produce the same results as an oven. Super easy peasy to use: There are so many pre-programmed settings on this thing, so you don't need to guess how long things will take to cook or defrost - it does it for you. 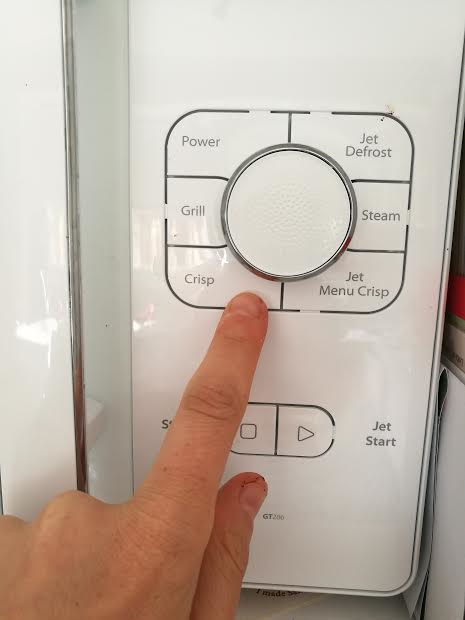 For example, to defrost hit the Jet Defrost button, select food type, set the weight and start - that's all that needs to be done! I love how this thing defrosts so fast and manages to keep the food in tact. I am forever forgetting to get meat out the night before and this is an absolutely life saver. 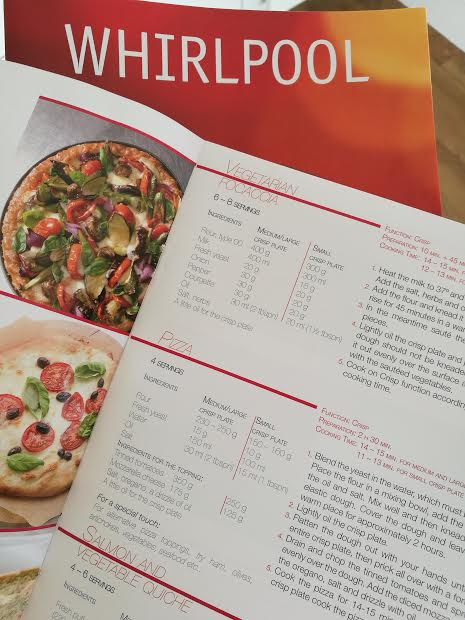 Practical recipes: The unit comes with recipe books that are full of staples for you to try out. I have also found several books available to purchase (and loads more to be found on Google) as well as a Facebook Fan page too. You really can treat this like an everyday appliance, rather than a simple reheating machine. The Crisp N Grill is available to purchase in Australia at Good Guys stores for an RRP of $499. Keep your eyes peeled for some pre and post Christmas bargains as these guys have some amazing sales year round!